Make sure that you keep making progress on your formal report. See your teaching assistant or instructor if you have questions about the format. You will have to perform the optical rotation measurement of the ligand during the catalyst synthesis. The ligand can be recovered for other measurements. Please note that the polarimeter will not be available during week 3 because it will be moved to the first floor. If you did not isolate 0.60 g of the Jacobsen ligand, you have to downscale the other reagents accordingly. If you do not have sufficient ligand to move on (>0.20 g), you will have to repeat the ligand synthesis because lab support or the instructor will not supply any ligand. It is highly advisable to crush up the Mn(OAc)2*4 H2O in order to increase the rate of the reaction. How does this work? The two-necked flask used should not be more than half-filled. Why? Note that the student will use the same water-condenser like in the ligand synthesis (with the closed cooling system of propylene glycol). The rest of the setup stays the same. The flow of air has to be properly adjusted: high enough to facilitate the oxidation but not so high that the solvent is removed. The same idea applies to the temperature of the hotplate: high enough to generate a gentle reflux and increase the solubility of the ligand and the Mn(II) acetate, but not so high that the solvent boils away during the reaction. If the solvent level lowers too much, the reaction will not take place anymore. The solvent level has to be kept around 20 mL in the flask (by adding more solvent if it becomes necessary). The gas inlet tube has to be immersed into the suspension in order to increase the uptake of oxygen. Since the glass tube that you will check out from lab support has a smaller diameter than the tubing used at the air line, the diameter has to be increased by wrapping a small amount of parafilm around it at the top. Do not use a Pasteur pipette because it will clog up easily if the volume of the solvent decreases signficantly. The reaction has to be monitored by TLC in order to determine when it is completed. How does the student know that this is the case? The removal of the ethyl acetate uses the rotary evaporator. 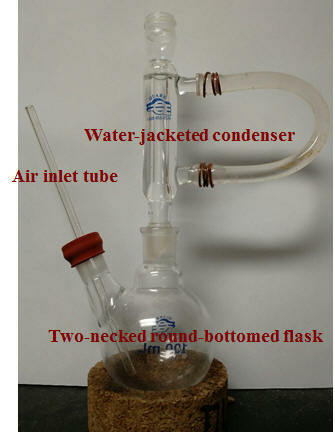 A round-bottomed flask has to be used for this task. However, the evaporation should be done slowly after the high-boiling petroleum ether was added. Why? How does the student know that the evaporation step is completed? a. Why do you have to reflux the ligand initially with 95 % ethanol? b. Which solvent mixture is used in this experiment for TLC according to the literature? c. Why does the student not determine the optical purity of the catalyst using polarimetry? How could the student determine the optical purity of the catalyst? d. Why are there no NMR spectra online for the catalyst? e. What is high-boiling petroleum ether? Why is it used here? f. Why is it important to not remove the entire solvent in the last step of the catalyst isolation? g. Why is the catalyst dark-brown and not yellow like the ligand?